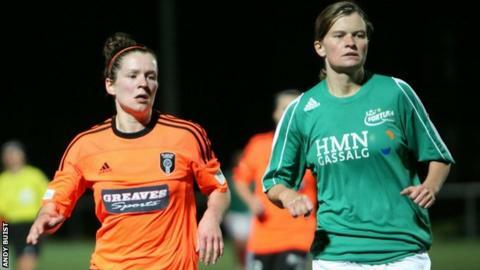 Glasgow City's bid to reach the last 16 of the Uefa Women's Champions League for the second successive year faltered as they lost 2-1 to Fortuna Hjorring. Looking to take advantage of a first leg at home, City fell behind to an early goal from Nadia Nadim. The same player doubled the visitors' lead with a clever lob but was denied a hat-trick when Claire Johnstone made a great penalty save. City dominated in the second half and Jane Ross curled home a fine finish. Ross had earlier seen a shot pushed on to the post and a thunderbolt free-kick from Emma Mitchell was also tipped onto the crossbar at a rainy Petershill Park. Fortuna reached the final of the competition in 2003 when it was known as the Uefa Cup and lost to Swedish outfit Umea IK. They have reached the last 16 of the Champions League in each of the last three seasons, losing out 4-2 on aggregate to Gothenburg, also from Sweden, last year. The second leg will take place on 3 October at the Hjorring Stadium.